Found Makaimura (ASCII) (Ghost'n Goblins)! 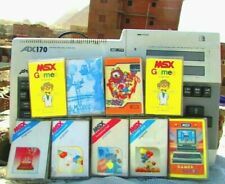 on site MSX Games World . He is using a cartridge with scc integrated (very few homebrew games has SCC chip integrated in the cartridge) , if you want to have moonsound music in the game you have to add to your MSX Turbo R or MSX2/2+ (if Z80 support is possible) and use a slot expander. This is not practical for playing a single game, in fact do you would spend so much money only for a game? (not all users has bought all sound & video expansions available). The very same for all machines, I believe he has made a great achivement with minimal hardware and have a very close version of the arcade machine the best in fact of any 8 bits computer without any doubt. Don´t think i am being rude, only i point some facts that people seems to forget about our system and about the reality of making a simple game. Would you buy a game that needs so many addons for playing? Of course if you see a bug, report it but don´t lose the perspective, this is not an emulator, is a game built entirely in MSX running on an MSX machine not a PC.